The following is an overview of the sequence of events of a typical job and is helpful information for anyone considering or installing new counters. Although this outline focuses on kitchen counters the process is the same or similar for most installations. Once you have a Job Confirmation, the countertop project goes through the production steps of templating, fabrication, tear out and installation. Tear out and installation occur on the same day. When we arrive for templating, we ask that you have cleared your countertops and keep the work area free of any objects. This will help us to finish the template efficiently, and will also protect your items from any dust or damage. Templates usually take a couple of hours. All sinks/cooktops/faucets are checked for compatibility and fit (therefore all such units must be on-site at template). Cabinets are reviewed for any adjustments required, as best can be determined. Overhang, general support and any personal preferences are discussed. Any refinements needed to cabinetry, etc., which will be required prior to installation of your countertops will be discussed with you. Seam placement will be discussed. 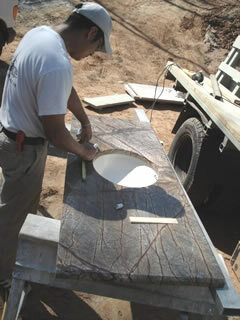 During installation, your undermount sink(s), if applicable, will be mounted under your stone. We ask that you do not plumb in or use the sink in any way for at least 12 hours. Please keep this in mind when scheduling your plumber to reconnect the water and drain. Also, cooktops and faucets, etc. will be dropped into place for confirmation of fit. Below is a list of information we will ask for prior to the production process. We prefer to obtain all of this information/material at time of templating or very soon after. Prior to fabrication, we encourage you to approve your slabs. We will ask that you review and give final approval of the Post Template Checklist. If your drawing submitted for your quote differs from your actual job we will let you know at this time and adjust the price up or down accordingly. If your project requires that we tear out and remove your existing countertops, we will do so at time of installation. At installation, we ask that you also clear the work area of any objects and clear a path for the installers to carry the granite. The installation phase can take the better part of a day; and can require some final cutouts to be made in your home.